On this day in April, 1941, Libya was on fire. General Rommel had begun to counterattack. 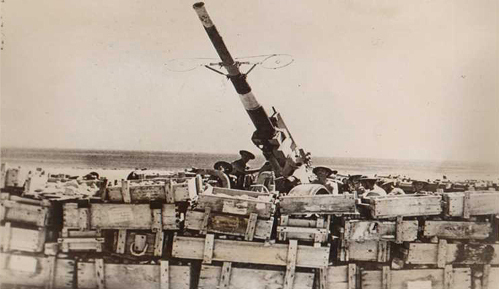 British troops were about to become trapped at Tobruk. It would be another two more years of desert war before Libya was safe and would become a rear area medical point for the British troops fighting in Sicily and Italy and a base for the American air force in Benghazi. But, in April 1941, it was a war zone. Between 1941 and 1984, Libya became westernized. Not only did it benefit from British-American medical modernization and the inevitable airports, it also became a fuel station for the West. Drilling began in 1956 and, by 1961, Libya was the world’s sixth largest producer, exporting mainly through Esso Petroleum and a consortium including BP, Texaco, and all other major western producers. The oil companies were nationalized when Ghadafi seized control in 1969. By 1984, Libya was literate, healthy, wildly overpopulated, and greatly unemployed. It also was operating as a terrorist state. By this day in April 1986, Libya had become personal to me. I was in London to run the marathon. By then, Libyans had murdered a British police officer (from its embassy in London! ), helped plan and execute the Berlin night club bombings that killed American servicemen and others, assassinated ex-patriots in Italy and attempted to do so in the US, and attacked its neighbors and its own citizens. In that week of 1986 the US and Britain exported arms to Libya again, this time via fighter planes sent to retaliate for the continued terror attacks. By December 1988, two weeks after I flew on one of Pan Am 103’s last flights, Libya was a sophisticated forerunner of Al Qaeda, killing American and British passengers en masse. UN sanctions brought Libya to its knees and, eventually, it surrendered the Pan Am 103 suspects for trial. One was convicted of the Pan Am 103 murders, one was freed. Reparations were paid. The good deed in question? In August, 2009, convicted Pan Am 103 bomber Abdelbaset Mohmed Ali al-Megrahi was freed from his Scottish prison because doctors concluded he had terminal prostate cancer, a disease very few of his ancestors would have lived long enough to contract in the days before British military doctors introduced penicillin to Libya and the world. Scotland freed al-Megrahi on compassionate grounds. Over the protest of the families of the PanAm 103 victims and the Obama administration, he was flown back to die in Tripoli. As of today, he reportedly is still well and getting around. Medical care in Tripoli, despite the rebellion, seems to have continued at the high level first achieved when British doctors introduced the world to penicillin there in 1943. By April 2011 we have learned, unfortunately, that more than just Al-Magrahi and British Petroleum got through Libyan customs and immigration: getting Libya back to business after it paid Pan Am 103 reparations also meant granting arms licenses. In order to bring Libya into the community of nations, Britain, Italy, the US, and others have bought oil and sold guns to Ghadafi. The weapons that he has turned on the rebels in April 2011 include arms and ammunition, artillery computers, military vehicles, and other items exported by Britain as recently as September. Now, Libya is on fire again, its war in the desert littered with bodies and wreckage. Except for the huge population, it could be mistaken for the Libya of 1941. History has repeated itself. My three part blog on Libya has been a departure from my usual posts about books and such, to be sure. But, the war in Libya and how close I came to being a victim of it has made me reflect on more than literature and letters and books about military history. If it has helped open those windows to the past with a look at things in print and the view that maybe we can better understand where we are maybe we can guess where we are today. The war in Libya, from Rommel to penicillin to Benghazi is history. To be sure, today’s war of Libya is a repeat of the war in Libya, having traveled from the desert to London to Berlin to Scotland and beyond and back again, dragging the US and Europe and much of Africa and the Middle East with it. History has a way of doing that. If only we had a way of learning from it.